Citroen, as a manufacturer, has been around for many years since Andre Citroen commissioned Jules Salomon to design a car suitable for mass production, a concept in which young Citroen was keenly interested. That was in 1919 with the Type A which the company manufactured more than 10,000 units each year between 1919-1921. Our Down-under correspondent, John Weinthal, has just spent some time with a Citroen and unearthed some more interesting, but this time Antipodean facts. Here are the Words from Weinthal. “I have learned some interesting things about the French car maker Citroen recently. For instance, Citroen claims to be the longest uninterrupted car importer on the Australian market, and in 1925 Baptist missionary Neville Westwood became the first person to drive a car right around Australia when he completed the epic journey in a Citroen 5CV. “Citroen is enjoying new success here in Australia since a change in importers and local dealers a few years back. And Citroen is reclaiming its reputation as a maker of innovative cars with its highly original luxury C5 sedan and the soon-to-be-released C3 small car. “Lovers of Citroens past, such as the original traction avant models - the world’s first really successful volume-produced front-wheel-drive cars - and the wonderful DS and ID models of the 1960s and later, will appreciate both these new Citroens. “This is good news for all who are interested in cars as more than just devices for getting from A to B. Citroen at the very least challenges other makers to reconsider some of their proven, but far from brave, practices. “These days Citroen is owned by the same group as Peugeot. For very good cost and engineering reasons they share some basic car platforms, but the two have then followed their own distinctive paths. 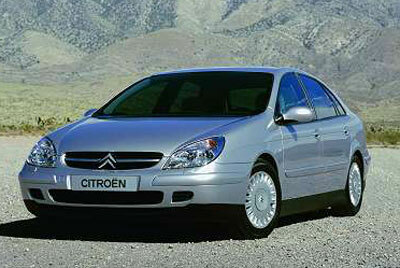 The C5 and C3 further emphasise the different marque values of Peugeot and Citroen. “In Australia Citroen is also determined to win sales with interesting cars which are very well equipped and which are priced to attract people wanting something different without initiating a trip to the bankruptcy courts. “This week’s test car was certainly different - a leather-clad luxury car with an impressive standard equipment list PLUS a diesel engine. Not only is it one of the few diesel engined cars available here, but it is unique in costing less than its 2 litre four cylinder sister C5 sedan. Diesels normally cost more than their petrol equivalents in this country. “But the common rail diesel model is only a small part of the C5 story. It has computer controlled hydraulic suspension which is self-levelling and ensures flat cornering. It can be raised to cross bush tracks or dry creeks so it has almost the same clearance as a Pajero. 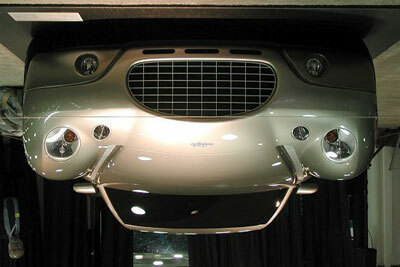 On the highway it lowers itself for better aerodynamics - which means improved economy. “It has automatic headlamps and wipers plus all the usual gadgetry, and a few extras like full powered seat adjustment for the driver and front passenger and fold down central armrests in the front and back. The interior is much bigger than one expects because it has a tall body, and the bone leather of the test car looked like a million dollars. “So, we have a true luxury car with a host of technical bonuses - far more than I have covered here in fact. And although it develops only 82kW, the diesel has high torque and can stay with all traffic from about 50 kays and upwards. Below 50 kph it is a little sluggish and very noisy. At idle, the noise is like a rattly diesel LandCruiser or Patrol. “But everything smoothes out above about 55 or 60 kays and the C5 cruises exactly how it looks like it should. The 101 kW four cylinder petrol and the extravagant AUD 57,000 157kW 3 litre V6 are no doubt more refined, but neither could come anywhere near the diesel for economy. Citroen claims it will go up to 1500 km on a 68 litre tankful. I doubt that very much - certainly not in city driving. But I averaged 7.8 litres per hundred kilometers and that is quite impressive for such a fully equipped luxury sedan. 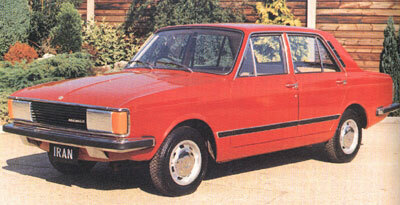 “Frankly I could not live with the diesel as a mainly town or city car. But if I lived in the bush or travelled long distances regularly it would make a huge amount of sense. The comfort is quite remarkable with the hydraulic suspension. It loves bad surfaces and winding hill roads. From 29 November - 1 December Thailand will host the closing round of the Asia-Pacific Rally Championship at Rayong Province. This event will also, for the first time, carry the prestigious King’s Cup trophy. This will also be the last round of the 6 round series of the Thailand Rally Championship and looks to be the Kingdom’s largest motorsport event. The 14th International Rally of Thailand 2002 comprises 16 special stages covering 259.04 competitive kilometres and a total of approximately 978.67 kilometres over the 3 days. The Rally starts from Rayong City and ends the first two legs at the Star Hotel, Rayong. The finish takes the competitors back to downtown at Star Plaza. The all gravel special stages includes mixed surface road sections through pineapple plantations, mountain passes and rural village roads. There will be many international rally teams from Malaysia, Europe, China, Australia, New Zealand and Japan, plus perhaps more, and it will be an excellent opportunity to view some famous and internationally renowned international rally driving stars. The 5th Round of the Thailand Grand Touring Car Championships will be held at the Bira Circuit this weekend (Sat/Sun 23/24). In addition to the touring cars (Group N + Classes A and B), there will be races for the single seater racers, the Sport Challenge class and the Sport Grand Champion class. These meetings are professionally run and include a lunchtime “pit walk” so you can come across the track via the over-bridge and see the cars more closely in the pits. On the same day, and also at Bira, but on the kart track, is the 5th round of the Thailand Gymkhana championships, so in between races you can go to the back of the grandstand and watch the gymkhana action. To complete the ‘speed-fest’, the Porsche Club is having a rally to the circuit and will do parade laps. You will get to see the latest GT2’s and GT3’s as well as some of the classic models. Being an ex-911 owner and racer myself, the sight and sound of a bunch of Porsches is music to an enthusiast’s ear. The circuit is on Highway 36 heading towards Rayong from the Regent’s School end and before you come to the fly-over with Highway 331. The action will start around 10 am on the Sunday 17th. Last week I mentioned that Rudi Uhlenhaut designed the Mercedes 300 SL with the famous gull-wing doors that opened up sideways, hinged in the centre of the roof. An ultimate classic car. There was, however, one big problem with this design. I asked what was it, and what did they do to correct the problem? The answer was that the side windows were fixed and the air circulation inside was very poor. They made air extraction ducts just behind the rear roof hinges to correct the problem. So to this week. Take a look at this car. I want to know where it was built and what is the connection between it and the Shah of Iran? At the end of 2000, Cunningham Motor Co., with $$$$ from General Motors and its (later) Vice Chairman Robert Lutz, promised to build a $250,000 sports coupe to be called the Cunningham C7. It certainly looked the goods and with 600 horses on tap it would have had the performance to go with the looks. However, another American Dream seems to have come to a rude awakening when Cunningham Motor Co. told prospective suppliers that the Cunningham C7 was not going to be built. According to my sources at Automotive News in America, the failure to resolve a legal dispute among the principals, which pitted Lutz and General Motors against company co-founder Briggs Cunningham III, ended all hopes, said Cunningham CEO Jack McCormack. “Cunningham Motor no longer can fund its operations,” McCormack said in an interview, because the $4 million of seed money is nearly gone. Of that amount, $2 million came from GM, at least $750,000 from Lutz and $500,000 from smaller investors. The company halted operations and development of the Cunningham C7 on Sept. 23, two weeks after Briggs Cunningham III sued GM, Lutz and other company principals. At the time, McCormack expressed hope that the suit could be resolved and that he could continue raising the estimated $85 million to build the first C7, but this did not happen. Lutz’s plan hinged on avoiding big investments in plants and equipment. It relied on suppliers to design, develop and assemble vehicle components into modules, which would be shipped to Roush Industries for final assembly. Cunningham Motor’s small staff has disbanded, and McCormack says he will retire to his Australian cattle ranch. Roush is storing the C7 prototype that was unveiled at the Detroit auto show in January 2001.